I recently made these cute and inexpensive engagement party favors and thought I'd share them with you. Last week, my friends Monica and Chris hosted a party to celebrate their new house and recent engagement. The evening was going to be a casual one with a potluck dinner and lots of dancing in the as-yet unfurnished living room, but we still wanted the guests to leave with a little something special to mark the occasion. With a chilly night theme of "Baby, It's Cold Outside," I decided to make personalized s'mores pops for the guests to enjoy either right on the stick or nuked for a few seconds to make them oooey and gooey. These favors look impressive, but they are super easy to make. The key thing is that you have to use jumbo-sized marshmallows. Produced by Kraft and a couple other companies, this huge marshmallows are each equivalent to five regular-sized marshmallows (and about 50 mini ones!) and they are awesome! I speared them on white and blue striped paper straws that I cut on the bias (for easier spearing). Once I had all my marshmallows on sticks, I dunked them in melted semi-sweet chocolate chips (I used Nestle chips thinned with 2 teaspoons of shortening) and rolled them around in crushed graham crackers. 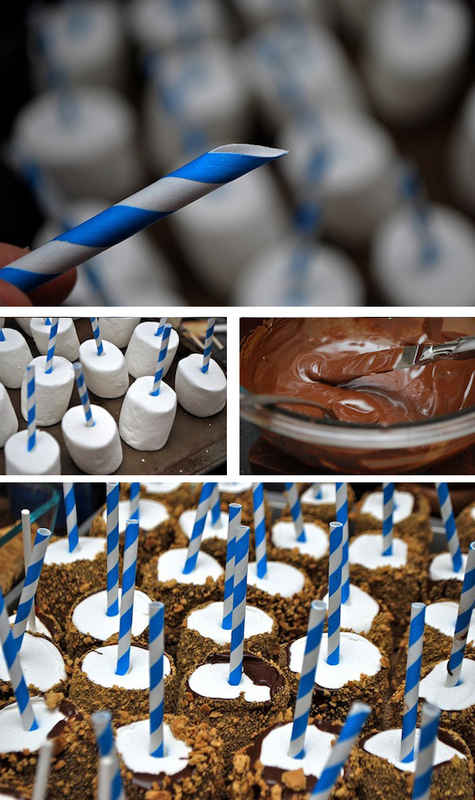 Once cooled, the marshmallow and graham crackers created a sweet and crunchy crust on the soft marshmallows. I designed a little label with Monica & Chris's names on it for each favor in Illustrator and then printed them out on regular paper (next time I'll use sticker paper, but I didn't have any when I made these). I chose a pretty icy blue and a few snowflakes to reflect the "Baby, It's Cold Outside," theme. I used spray adhesive to attach each label to small clear cellophane bags (50 for $3 at the craft store). Since the marshmallows are huge, one per bag is enough. I sealed the bags tightly with twist-ties to keep them fresh. The marshmallow pops were a hit, with some guests grabbing two and three to take home! Fortunately I prepared several extra so there were plenty to go around. Total cost for 60 favors came to just under $15, or less than 25 cents each. You should also feel free to improvise, using different kinds of chocolate or toppings. I made some with white chocolate dipped in coconut, and some with milk chocolate. Have fun with them! Also just from experience, I figured out that the best way to set the pops completely is to put them in the fridge for five minutes after you roll them in the graham crackers. Planning an event and want some help with favors, decor, dessert tables, or invitations? I'm now taking on a few event design clients and would love to help! E-mail me for more details!